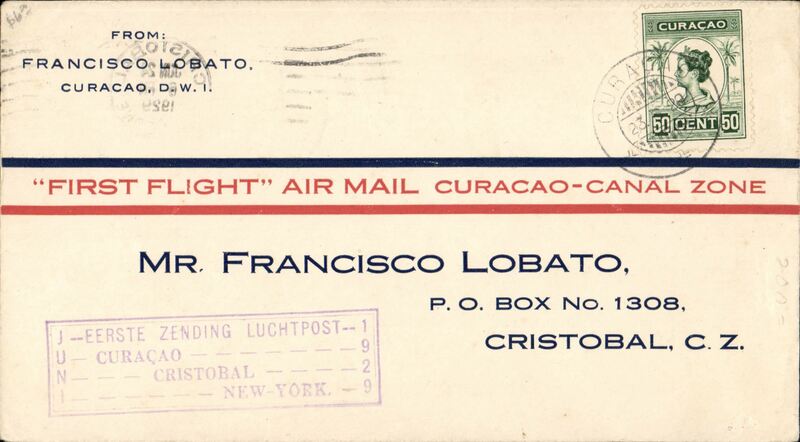 Netherlands acceptance for Colombia, Curacao to Barranquilla, 28 Jun 1929 arrival ds on front, carried from Curacao to Cristobal, bs 24/6 on the Pan Am F/F Curacao-Cristobal-New York, violet framed F/F cachet. Nice item. 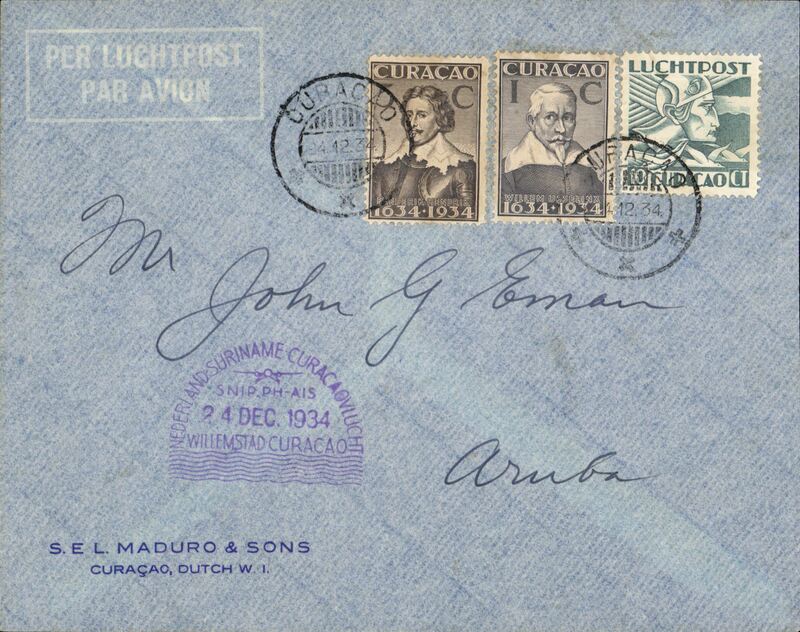 Curacao extension, F/F FAM 5, Curacao to Cristobal, purple cachet, b/s, souvenir cover franked 50c, Pan Am. Carried by Sikorsky S-38A amphibian. 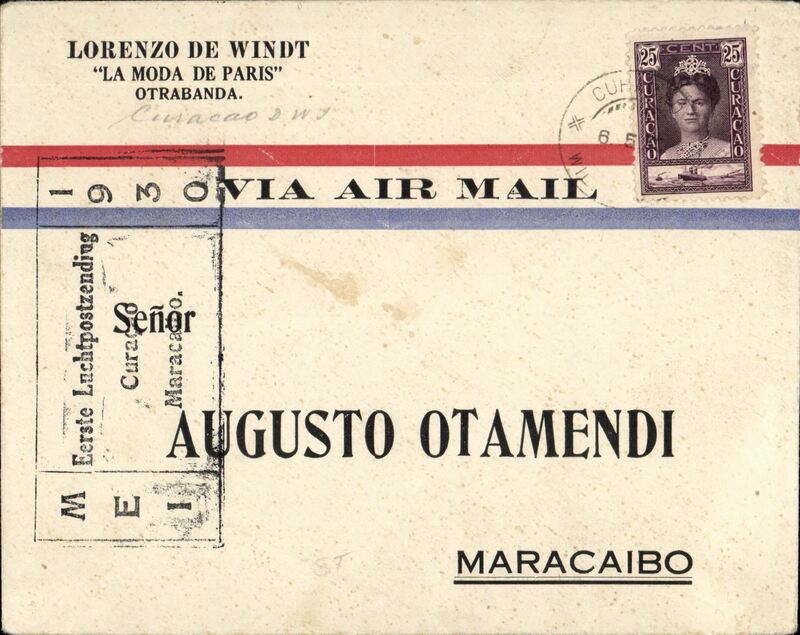 Netherlands Antilles-Curacao TEST FLIGHT Mu#24a Aruba 28/8/34 to Curacao 28/8, special 10c surcharged stampTwo ironed vertical creases verso. 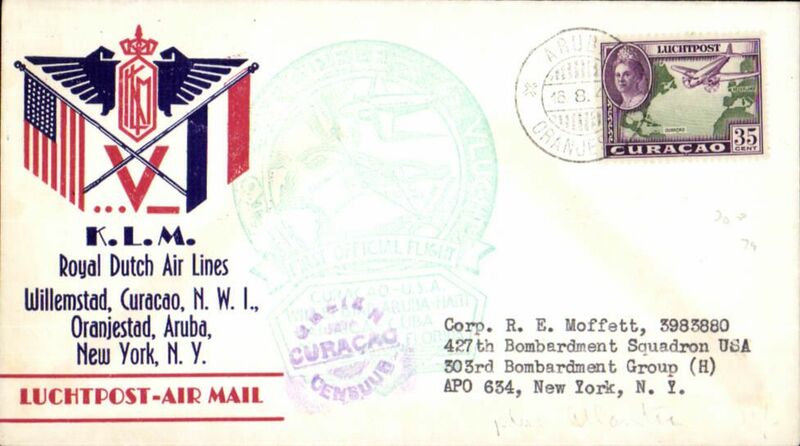 F/F Curacao to Aruba, Mu#24a Aruba 28/8/34 to Curacao 28/8, Muller 25a, franked 16c, and violet 'domed' Curacao 22/12 arrival cachet verso. 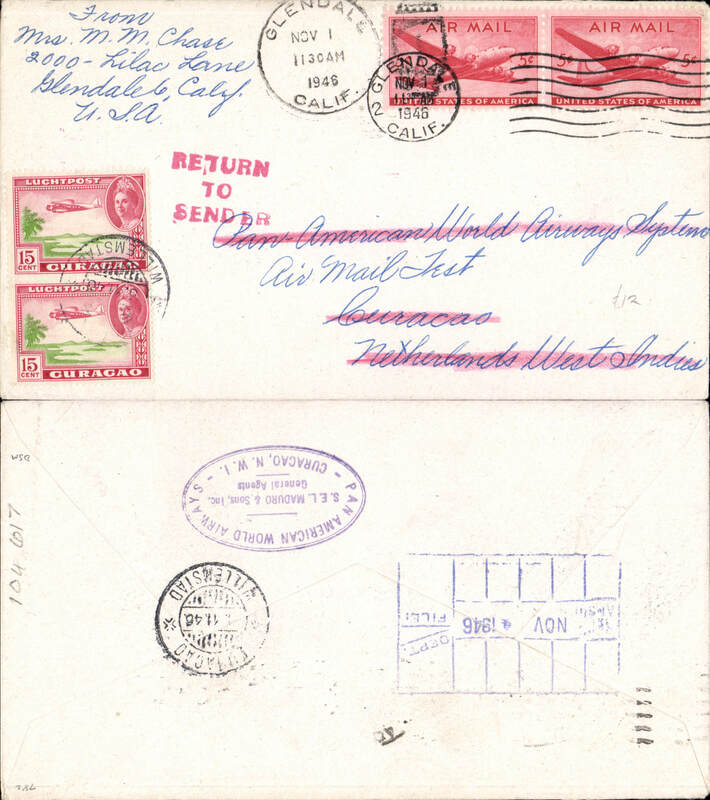 Flown World War II cover from Hato Field, Curacao to USA, franked 6 canc American Base Forces PO cds, APO 812 return address , "Passed by US Army Examiner" hs. 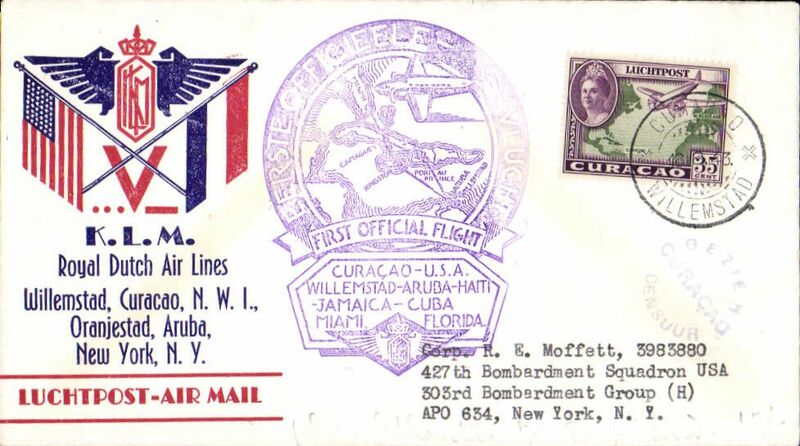 KLM, F/F Curacao to New York, no arrival ds, souvenir company cover franked 35c, large green flight cachet, tied by violet Curacao censor mark. 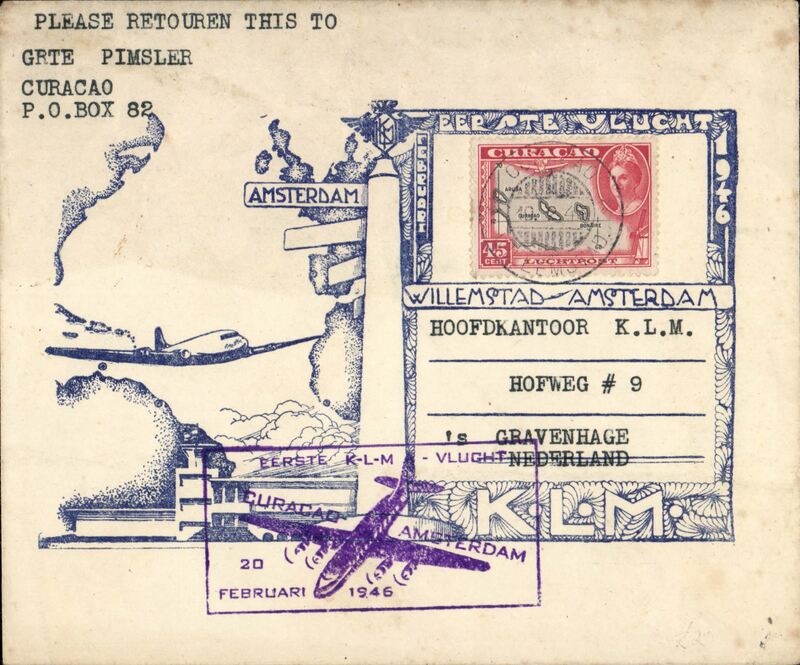 KLM F/F Curacao to Amsterdam, no arrival ds, blue/white souvenir cover franked 45c. 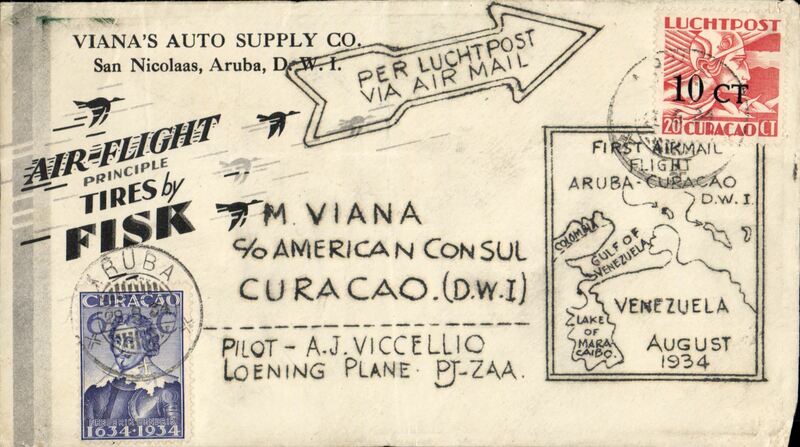 Airmail round trip test cover to Curacao, bs 2/11, franked 10c Transport, canc New York, NWI stamps 30c cancelled for the return, and blue PAA Office "Received Nov 2" cachet verso, Pan Am. 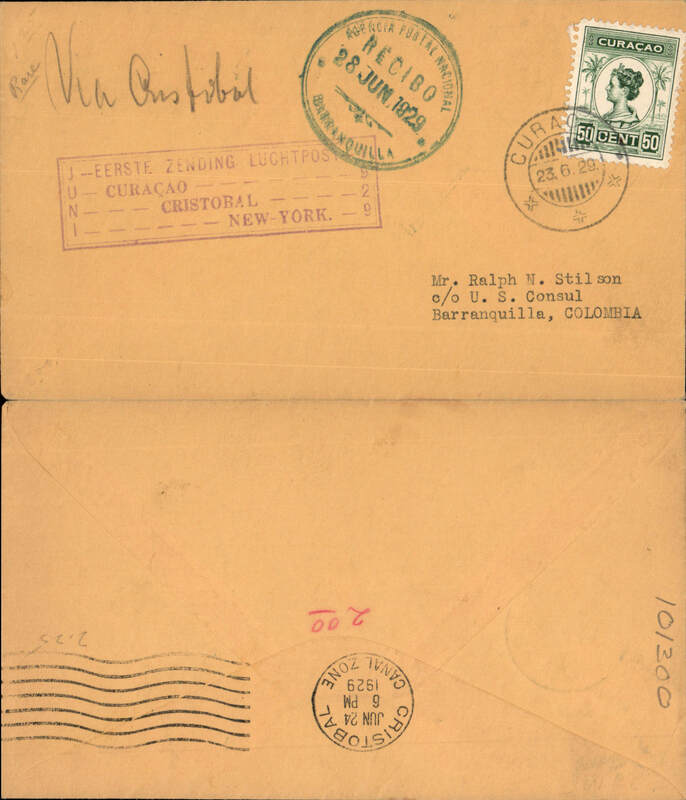 See article in Apr/June 1998 JLKAL by R Saundry about the, as yet, unrecognized, scarcity of these covers.